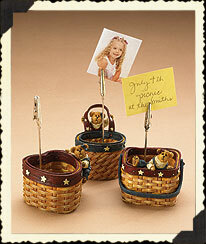 Each tiny basket features star accents and a spring-loaded clip to hold a favorite photo, a note, a newspaper clipping, recipe or what have you! Stash lil' stuff in the basket for double duty! 5 cm width x 3 to 4cm depth x 11 cm tall (Height taken at the tallest point, this being the clip that holds the notes or photos). ONLY 1 Set In Stock!